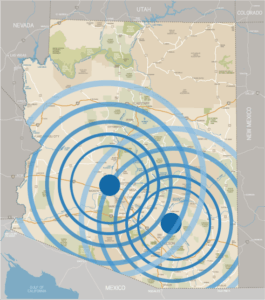 In 2007, Arizona had over $164 billion dollars’ worth of freight picked up to be shippped. In only a few short years, the economy has begun to start growing in leaps and bounds, escalating the amount of freight and its value being shipped from Arizona. In fact, this has created a huge demand for reliable and trustworthy shipping and delivery methods. Xcel Delivery Services has the services that your business requires for your business growth and optimum customer satisfaction. Our Scheduled and Routed Delivery Services make your everyday shipments and routine pickups hassle-free. Scheduled Delivery Service and Next Day Routed Service is available to all of our customers to ensure deliveries makes their destination on time. Xcel Delivery Services makes scheduled and routine deliveries in numerous industries, including banking, pharmaceutical, and bio-medical. Inter-office and corporate shipments have become a large part of our daily services, giving businesses across all industries the critical time-sensitive delivery solutions they need that also prove to be cost-effective. Scheduled Service provides the comprehensive dedicated solution you require for your scheduled shipping needs, no matter the frequency; daily, weekly, monthly, and seasonal. We have many vehicle options for our customers, from having a dedicated tractor trailer picking up your freight and making local deliveries to having a cargo van pick up your shipments every Tuesday and Thursday to ship out of town, we can meet your needs. No matter what your consistent dedicated requirements are, Xcel’s Delivery Schedule Service is the reliable and trustworthy carrier choice. Call 520-408-7200 today to speak with one of our professional and friendly team members. If you have daily pickup and delivery needs, then Xcel’s Next Day Routed Service is going to prove to be the most efficient for your business and its bottom line. Whether you need a daily pickup with one driver, or a weekly pickup that requires 3 vehicles and 3 drivers, we can do it. We will create the most cost-effective delivery solution for your business that will remove the hassle and aggravation of trying to get your packages out the door for a next day delivery. The Next Day Routed Service is available year round, 365 days a year, 24 hours a day. With this particular service (daily minimums apply), your product pickup will take place at the end of each scheduled business day, and will be delivered to the destination by 2:30pm the following day. You can take confidence that your deliveries will be handled by professional drivers that are highly trained and pay meticulous attention to safety. The entire Xcel Delivery Services team makes it a priority to exceed our customers’ expectations. If you are ready for the professional and reliable Next Day Routed Service, pick up the phone today and dial 520-408-7200 to discuss the delivery business solutions for your company. We utilize many different types of vehicles to help reduce costs of our deliveries. From large box trucks to small passenger vehicles we can custom fit your delivery efficient and effectively. Xcel Delivery Service takes pride in the professionalism of the long time family owned company, including holding the highest expectations from our drivers. Our team of drivers are highly trained, safe, reliable, professional drivers who care about our customers as much as we do. We all work together to ensure the highest in customer satisfaction, so you can rely on getting the best service from pickup all the way to the confirmation of the on time delivery of your shipment.